The European Network on Inclusive Approaches to Trade Policymaking (ENIATP) is an international research project funded by the Institut des Amériques and connecting academic scholars from Université Sorbonne Nouvelle, Ghent University, Sciences Po Paris, the University of Warwick, the London School of Economics, and University of Rennes 2. 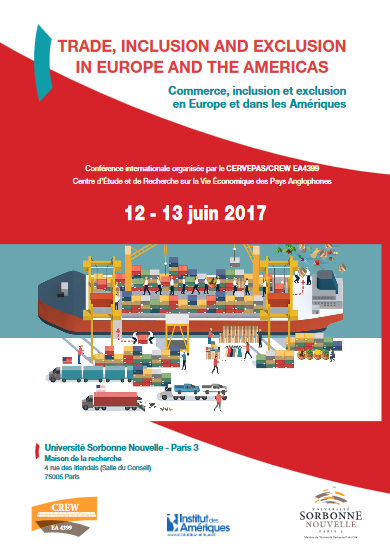 Présentation : This international conference will analyze the current anti-globalization backlash and the search for inclusive approaches to trade policymaking to provide creative thinking on the links between trade, exclusion and inclusion. To do so, it brings together an interdisciplinary panel of academic and policy experts with the aim of promoting new research on the democratic governance of (cross)regionalisms, trade agreements and trade policies. From a methodological standpoint, our goal is to develop new theoretical concepts and methodological tools to keep up with the changing nature of international trade agreements. Here, we will draw from two cutting-edge subfields of trade policy analysis. The first consists of new constructivist approaches to trade policymaking and political economy, and more specifically a new strand of research seeking to understand the ways in which economic ideas and “fictional expectations” can capture or “dis-embed” economic decision-making. Here, the objective is to question and deconstruct key trade concepts and models that have long structured and constrained the representation of trade agreements and regionalism among scholars, policymakers, the media and the public. The second innovative subfield relates to the processes of civil society inclusion in trade policymaking. Our objective is to design robust analytical tools so as to bring new focus to a long debate that has re-emerged with the stormy debates surrounding CETA, TTIP and TTP in Europe and the Americas. Here, the participants may present new methods to conceptualize and operationalize notions of inclusiveness, accountability and/or transparency to assess the modes of participation of civil society groups and their actual input in the three phases of trade policymaking: 1) the pre-negotiating phase, 1) trade negotiations and 3) the enforcement and monitoring phase. Our goal is to rethink the theory and practice of trade policymaking to better understand why international trade has failed to garner support and to determine the conditions under which disaffected citizens could regain confidence in economic globalization.